At ICADV we know that violence is preventable, and every day we are working towards our vision of a world where all intimate relationships are non-violent and equitable. While want to eliminate violence, and we also want to promote safe, supported, and respectful relationships. We work for equity, across identities and multiple types of relationships, to ensure that our physical safety and emotional wellbeing are respected in our intimate relationships. At ICADV, we are working to make safe and respectful relationship behavior the easy and expected choice. To create relationships that are equitable and non-violent, we believe we have to fundamentally change the ways that we use power in relationships. We work to move from a model that celebrates competition and supports the use of power over others to one that celebrates shared, collaborative, and collective power. To solve the problem of violence, we believe that we have to start by really understanding what’s going on with that problem. We believe that elements of mainstream culture make it possible for most of us to exercise power over those with less power in our relationships. Physical acts of violence are prevalent, normalized and even justified in our culture. From spanking within families to wars between countries, most of us believe that some acts of violence, for punishment or correction, are justifiable. Additionally, societal standards about how we value people based on their perceived identities—gender, ethnicity, sexual identity or orientation, age or abilities, among many others—gives some people more permission to exercise power in abusive ways than others. To create relationships that are equitable and non-violent, we believe that we have to fundamentally change the ways that we use power in relationships. We work to move from a model that celebrates competition and supports the use of power over others to one that celebrates shared, collaborative and collective power. Behaving in controlling ways is a choice that’s available to most of us, most of the time. Some of us act on that choice, but most of us don’t. Why is that? Though we know that intimate partner violence can and does happen across all groups of people, we believe that differences in exposures, experiences and opportunities results in different motivations for the use of abuse. In a culture that often equates success with financial and material success, we believe that those of us with experiences of significant disadvantage may feel motivated to exercise power over those in our closest relationships in order to compensate for feeling disempowered, devalued or disrespected. On the other end of the spectrum, we believe that those of us with life experiences of unearned privilege (because of the status that society confers on us according to our identities) may choose to exercise power over others in our relationships in order to reinforce that privilege. We see these motivations playing out among individuals, but we also see the broader influence of histories of trauma for some communities and histories of privilege for others. We believe that unfair inequities between groups of people in our culture — both through identity-based disadvantage and unearned privilege — fuels multiple forms of violence. This means that we can’t solve the problem of violence by educating people abusive behaviors and telling them not to engage in them – because behavior is not driven by facts alone. To be effective, we have to address the cultural conditions that give people permission to exercise power over others, and also the motivations that increase the likelihood that some of us will make that choice. This doesn’t mean that we shouldn’t hold individuals accountable for the harms that they abuse; it just means that in the long-run, we will be most effective at preventing violence when we change the cultural context that enables it. Respectful relationship behaviors is the easy desirable choice. We believe we have to make respectful relationship behavior the easy and expected choice in all of our relationships. This requires a lot of modeling of positive relationships and respectful relationship skills. Where people consistently see and experience great relationships, they will have increased relationship skills, and we’ll also establish a cultural norm that respectful relationships behavior is our shared expectation. Abuse is not an option that someone feels they need to choose. We need to create societal conditions where abuse is not an option that people feel the need to choose. For us, this means working to reduce the power differences between people, because these power differences and result in feelings of alienation and dis-empowerment among those with little power and a misuse of privilege and enabled abusive behavior among people with greater power. We believe that where all of us feel included and valued in our communities, we will feel little motivation to behave in abusive ways. We do this by working for equity in opportunity and protection for all members of our communities, meeting their basic needs, advocating for strong education systems, and changing public policies to support families. Abuse is not an easily-available option for someone to choose. We are working to ensure that abuse is not an easy choice for individuals to make. We believe that where community members are connected and engaged, social accountability is increased. A shared sense of community accountability requires us to challenge privacy norms around relationships and requires us to both proactively check in with the people in our community about how their relationships are going, and also to consistently hold one another accountable for disrespectful behavior in order to demonstrate that abuse simply does not work within our community. We also work to create community systems that support connections and engagement among residents in order to promote and support community accountability. The work to promote respectful community environments that deter multiple forms of violence creates lots of opportunities for action. While we have unlimited passion for this work, we are often limited in the resources needed to complete all of it, all of the time. Therefore, we try to make careful decisions about the prevention strategies we choose to take on, in order to maximize our impact. Our commitment to preventing violence requires us to be disciplined and strategic in the actions that we take. 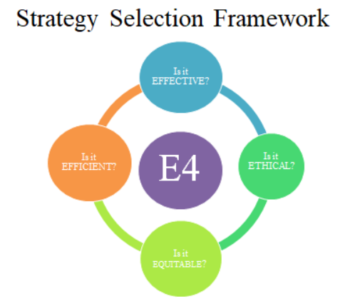 ICADV created the E4 Framework to help us assess proposed prevention strategies to ensure that they’re the best ones for moving us towards our vision. Does this strategy have the potential to impact broad populations and/or multiple social problems? With consideration of our limited resources and the overlap in risk and protective factors between multiple social problems, it is in our strategic interest to maximize our impact by working at the intersections. Does this strategy seek to reduce or eliminate risk factors in the community, or does it require vulnerable individuals to navigate those risks? Rather than relying on vulnerable populations to change their behavior to try to safely navigate risks, we believe that it is the responsibility of the broader community to work to reduce those risks in order to make respectful behavior the easy and expected choice for all of us. This does not mean that members of traditionally marginalized communities shouldn’t lead these efforts; rather, privileged individuals, programs and systems should work in collaboration with diverse leaders to reduce risks and to ensure that opportunities to safely thrive are available for all community members. We will not introduce or invest in prevention strategies that result in increased health and safety disparities between advantaged and marginalized populations. If you have concerns about your relationship or a friend’s relatioship, we recommend you visit Love is Respect. You will find information about consent and healthy relationships, and you can take quizzes that help you decide if you are a good partner or in a healthy relationship. You can also chat with an advocate online, text loveis to 22522, or call 1.866.331.9474 (TTY 1.866.331.8453). The Centers for Disease Control and Prevention have identified creating protective environments, with particular focus on improving school climate and safety, as effective strategies for preventing teen dating violence and intimate partner violence. ICADV and the Domestic Violence Network have created this Best Practice Template for the Prevention of Teen Dating Abuse and Sexual Harassment, adopted by the Indiana Department of Education. The policy centers on promoting a safe and supported school environment to prevent multiple forms of abuse and to stimulate academic success among all students. We all play a role in preventing violence by creating environments where all people have the opportunity to thrive in safe relationships — where respect is the easy and expected choice. We believe that Small Moments can make a Big Difference. That’s why we created the Small Moments campaign. Here, you can learn what communities around Indiana are doing to take action to prevent violence by promoting safe, stable, and nurturing relationships and environments. ICADV is thrilled to share our Prevention Storybook with you. This coloring book provides an overview to our understanding of the problem of violence, our prevention framework, and examples of community-level prevention strategies we’ve undertaken with partners over the past several years, in an approachable and interactive format.